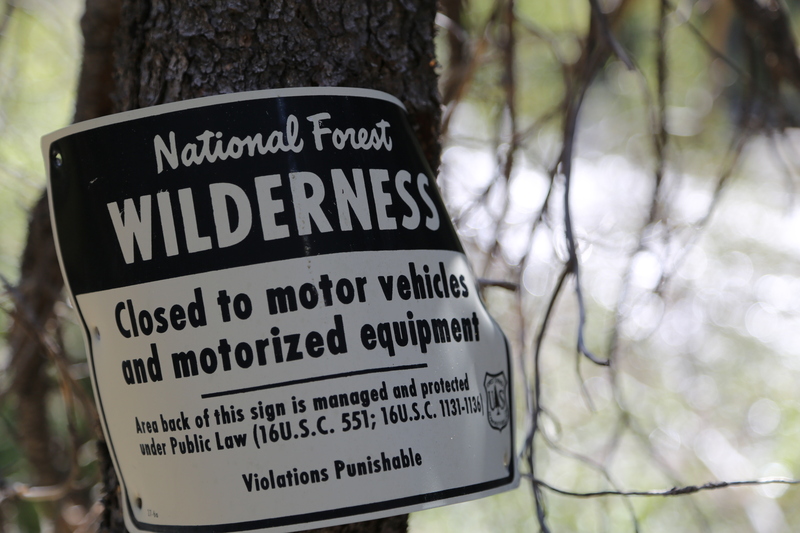 For the final assignment in this course, I worked with Ben Banta to create a video highlighting safety in backcountry skiing and snowboarding. Ben interviewed Greg Ley of the UW Outdoor Program who discussed the importance of safety and experience while recreating in the backcountry during the winter. Greg also briefly discussed some of the rentals and courses that the UW Outdoor Program offers that relate to backcountry skiing. We also interviewed Anthony Natale, a backcountry snowboarder who discussed why he prefers backcountry snowboarding and how he stays safe. We decided to not place talking heads in front of the camera for this project, but instead record audio interviews and compliment them with related footage. In order to execute this, we had to spend a fair amount of time filming snowboarding and skiing in the backcountry. I found this experience to be interesting because I basically had to act as a director. Rather than simply filming people as the were snowboarding, I tried to set up shots and get specific angles which required a lot of communication and coordination with the riders. While this was difficult at times, I think our final product came out a lot better than if I had adopted a “point and shoot” mentality as riders came by. I was surprised with how much raw footage it took to complete this project. Our final product was close to two and half minutes, which I estimate required about 6-8 hours of raw footage. The footage on our final video is the culmination of four different days spent filming in the backcountry. Filmmaking is my passion, so I hope to be able to apply my knowledge of editing frequently in my future career. I like making videos because it is a combination of all forms of media. Filmmaking incorporates concepts from photography, audio editing, graphic design, and journalistic knowledge. I enjoy the challenge of trying to tell a story using multiple formats, and I hope to one day work full-time as a filmmaker. For the live Tweeting assignment, I attended the Laramie Valley Trout Unlimited monthly meeting at the Wyoming Technology Business Center. Scott Christy, the Wyoming Coordination for Trout Unlimited, attended the meeting and spoke about conservation issues, river restoration, club financing, the programs TU has in place in Wyoming, and 2015 events. I attended the meeting as part of the University Fly Fishing Club to discuss working together with LVTU for spring semester events and conservation projects. Since I was participating in the meeting, I was not able to tweet on my phone or computer while it was in progress. I wrote my tweets down and entered them after the meeting concluded. Attending the meeting with the intention of tweeting it made me listen to the speakers in a slightly different way. I normally don’t think about the way I am listening to someone when they speak, but knowing I had to tweet the event made me do so. I listened carefully for good quotes I could use and information that would be interesting and useful to people who may not be involved in fly fishing. I liked how knowing that I had to tweet the event made me participate in it in a more journalistic way. Listening for quotes and information that may possibly appeal to people outside of the fly fishing world was a bit distracting at times and caused me to miss some information. Unfortunately, I entirely forgot to take a photo of the event, and in hindsight it may have been better for me to choose an event that I did not have to participate in. I think the fact that I had to think about how I was going to tweet the event while I was trying to participate caused me to lose focus. Although I wasn’t as focused as I could have been, I think this assignment was good practice for learning how to multitask as a journalist at an event. For the Soundslides project, my partner Ben Banta and I created an audio slideshow about opening day at Snowy Range Ski Area this season. For this project, Ben and I had to capture a large amount of photos of the ski area and facilities, as well as conduct and record audio interviews with two Snowy Range employees. Our goal was to create a slideshow with complementary audio that highlights the work that goes into opening a ski resort for the season. I enjoyed working with a partner on this project; I think that introducing a new perspective to a project greatly improves the outcome. It was good to have Ben’s input on different aspects of the project because it allowed me to see what we were photographing in a different way. Ben also asked some important questions in his interview that I would not have thought to ask. The only thing I found difficult about working with a partner on this assignment was actually finding the time to get together. Ben and I found that we both had fairly busy schedules and weren’t able to meet up and work together as much as we would have liked to. We were able to complete some parts of the assignment together, but we also had to figure out how to work separately and still complete the project. We went to Snowy Range and photographed the mountain together – I liked having two perspectives for this portion of the assignment. Ben and I had to work on the remainder of the assignment separately. I conducted an interview with Jarrod Tamez, edited the photos, and edited the audio files. Ben conducted an interview with Anthony Natale, and put the edited photos and audio files together on Soundslides. Overall, I enjoyed this assignment and working with a partner on a multimedia project. I would have liked to have planned the project more efficiently, this would have allowed Ben and I to collaborate a bit more on the final product. This is the edited form of the audio interview that I conducted with Ben Banta recently. I found that the audio editing process presented its own unique challenges, just as the audio recording process did. I have been editing audio as a part of my video production work for several years, so this stage of the assignment was the least difficult for me. I enjoyed being able to work with Adobe Premiere Pro for this assignment. Although Premiere is a video editing program, it is also a very powerful audio editor. Premiere features many audio effects and editing tools, some of which I was able to familiarize myself with during my internship this past summer. Working with this program allowed me to negate the guesswork of learning a new audio editing program, and focus on the quality of my project. Although I was mostly familiar with the basic audio editing features of Premiere Pro, I still tried to take my time with this project; I listened to the entire raw audio file several times in an attempt to locate the most interesting topics that Ben discussed. I also tried to experiment with some of the effects that I wasn’t entirely familiar with – most of this was trial and error. By experimenting with different effects, I was able to learn how bass, vocal enhancers and equalizers vary the quality, tone, and pitch of an audio track. In the end, I decided to add a bit of bass and vocal enhancers to the audio file. I believe the edited track has a better, more rich sound. I was mostly aware of what I would be doing with the raw file once I decided I would edit with Premiere Pro, so there weren’t any surprises for me in this assignment. There is still some audible shuffling that can be heard in the edited profile. The background noise is something that I found difficult to eliminate in the editing process, and I wish I had set the microphone up in a way that eliminated this during the interview. Overall, I believe this project went smoothly. Ben was an excellent interviewee, and aside from a bit of background noise here and there, I am extremely satisfied with the result. I interviewed Ben Banta about why he decided to pursue a degree in Communications at the University of Wyoming. I have been involved in recorded interviews before, but only as a camerman. My experience as an interviewer for this assignment was fairly simple, I asked open-ended questions and he told his story; I don’t think either one of us really noticed the microphone once the interviews began. As the interviewee, I felt comfortable, it is usually easy for me to talk about things I am interested in, and the whole interview felt conversational and fairly informal. For me, the most difficult part of the interview was timing. I had to think about how to time questions and estimate how long answers would be so that I could keep the entire interview within the proper time limit. I had a hard time communicating to Ben that we were running short on time, which made it difficult to wrap up the interview. I thought the content of the interview was excellent, but I did find that the ending was rather abrupt. In hindsight, it would have been beneficial for us to agree on some sort of hand signal to indicate that time was running out before conducting the interviews, but I am still satisfied with content I was able to record. I enjoyed that I was able to interview someone with an interesting story. It was easy to tell that Ben was passionate about the events in his life that led him to seek a career working with multimedia, which made for excellent content in this interview. I was actually surprised with how few questions I had to ask throughout the five minute process; there were a lot of events in Ben’s life that led him to where he is now and he spoke about them passionately. I am confident that I will be able to create a compelling edited audio profile with the content I was able to capture. 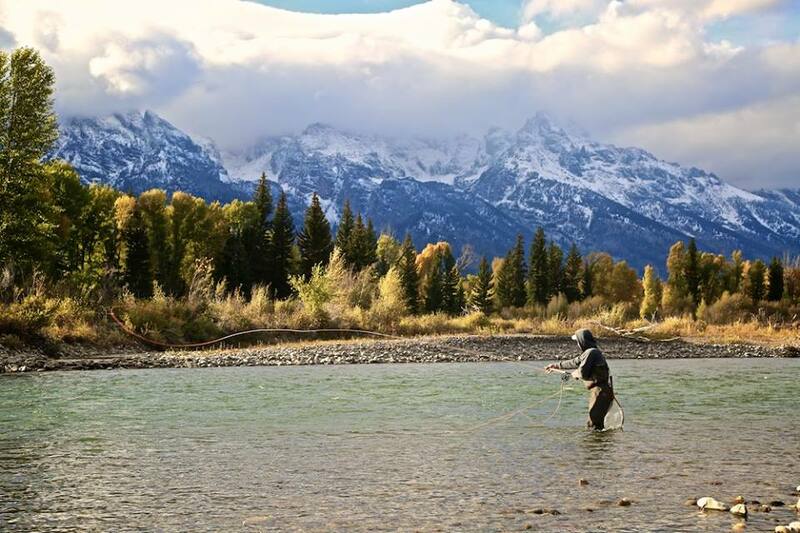 I took this photo of an angler fishing in the Snake River in Jackson, WY. I was intrigued by the colors of the trees against the mountainous background; I was also hoping to capture the fly line as it moved through the air. 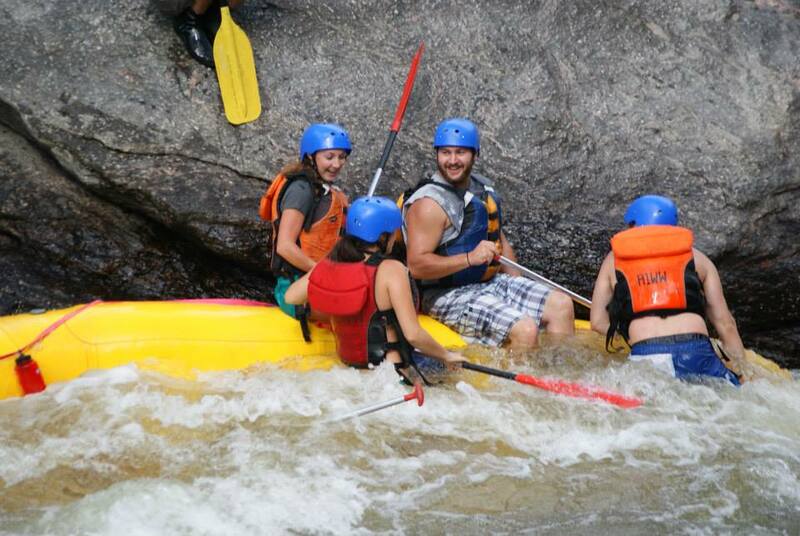 Non-sports feature: I took this photo on the Cache la Poudre River near Fort Collins, CO on labor day weekend. As I was fishing, a group of whitewater rafters came by, I thought I should snap a photo while my fishing was ruined. 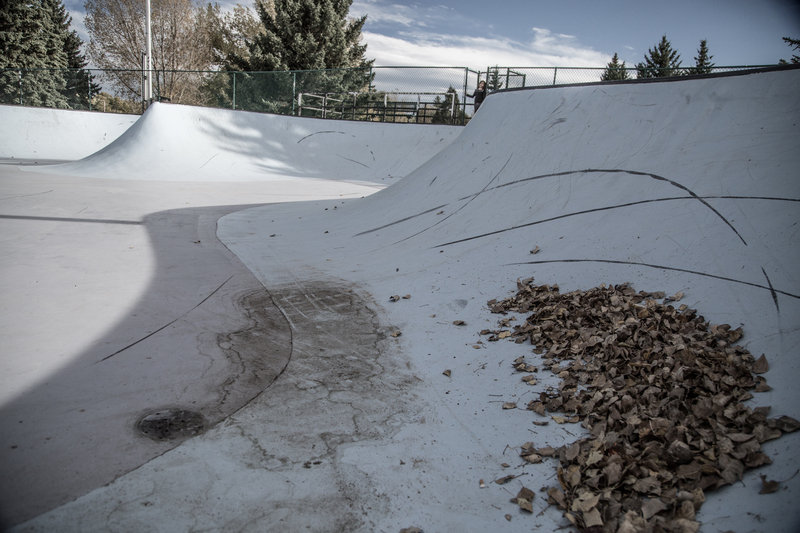 A skater cruises through one of the bowls at the Laramie skatepark. Sports feature: I took many photos during my time at the Laramie Skatepark, some of which had good action in them. I chose this basic photo, however, because I really liked how all of the shadows fell on the image. It felt to me like there was a sense of activity and stillness at the same time in this image. I took this photo during my shoot at the Laramie Skatepark. While I was shooting action shots, I noticed leaves collecting in one of the corners and an individual looking on subtly in the distance, which I thought would make for a striking but subtle image. Students emigrate from class to class along Ivinson St. 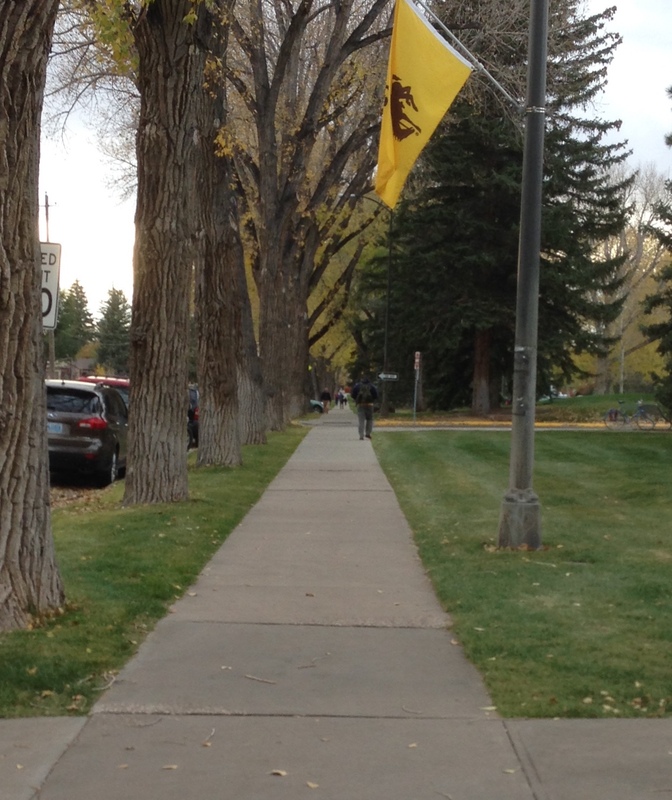 I took this photo on my way back from class on a fall day in Laramie. I was struck by the line produced by the seemingly endless sidewalk and the canopy of trees that towered over it. Additionally, the flags on each post along the entire length of sidewalk to 9th street made for a nice canopy although many of ended up blocked by the foilage. 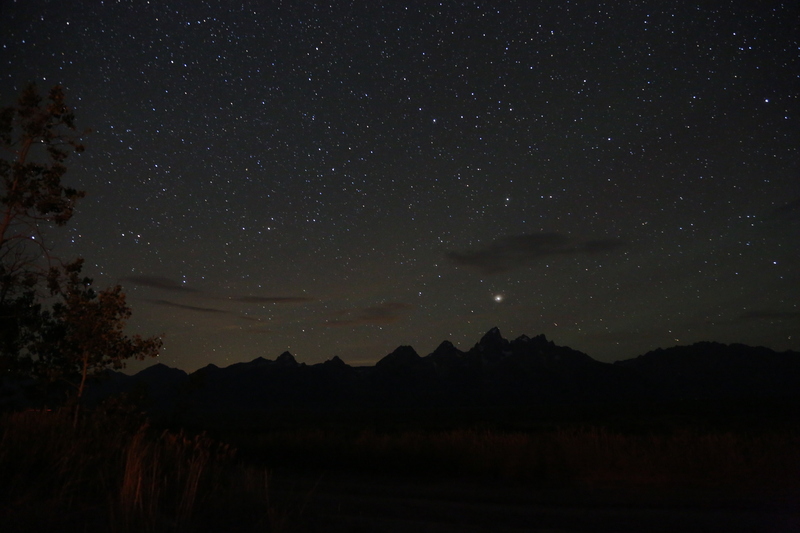 Stars over the Grand Tetons in Wyoming. This photo uses the slightly illuminated tree in the foreground to create depth. Including the tree in the foreground creates a sense of depth and gives a little bit better sense of the distance to the Tetons in the background. A fisherman looks at his fly stuck in the tree above. The main device utilized in this photo is focus. I decided to focus on the fly to indicate that it was stuck in a tree, if I had focused on the angler, the fly may have not even been noticeable in this photograph. 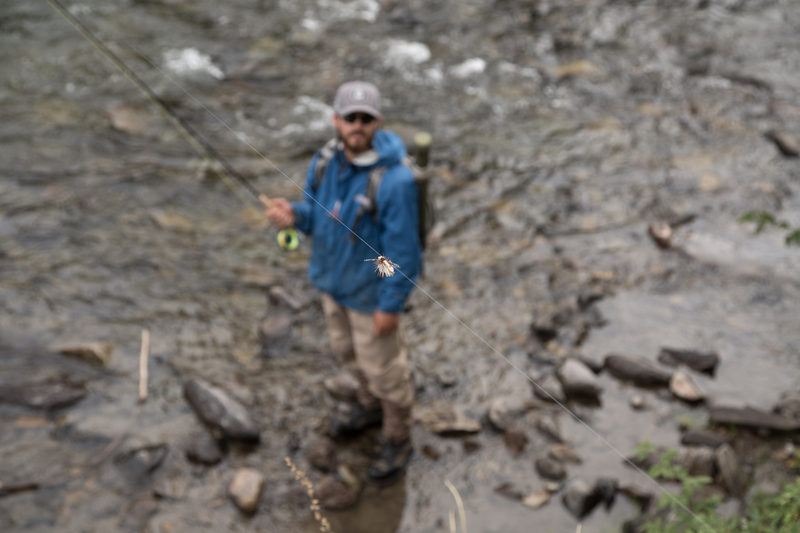 This image also uses color as a balancing element as the blue jacket draws focus to the angler, resulting in focus moving between the angler and fly stuck in a tree. This photo also uses perspective as I was about 20 feet higher than the fisherman I photographed. I was mainly attempting to make the sign stick-out when I took this photo. I used background and got close to the sign and focused in on it. By getting so close to the sign, I effectively blurred the background enough to make the sign really stick out in the image. I used focus to create the effect on the background, by focusing on the sign, I didn’t remove anything from the background, but I did make it unnoticeable and the least dominant force in the image. Aspen and Cottonwood leaves collect along the banks of Laramie River. The main focus point in this image is the color; the brightly-colored leaves are the dominant aesthetic force in this photo. This photo also uses balancing elements as the leaves, being the dominant force, are balanced by the gray rock and the exposed ground on the right-hand side. 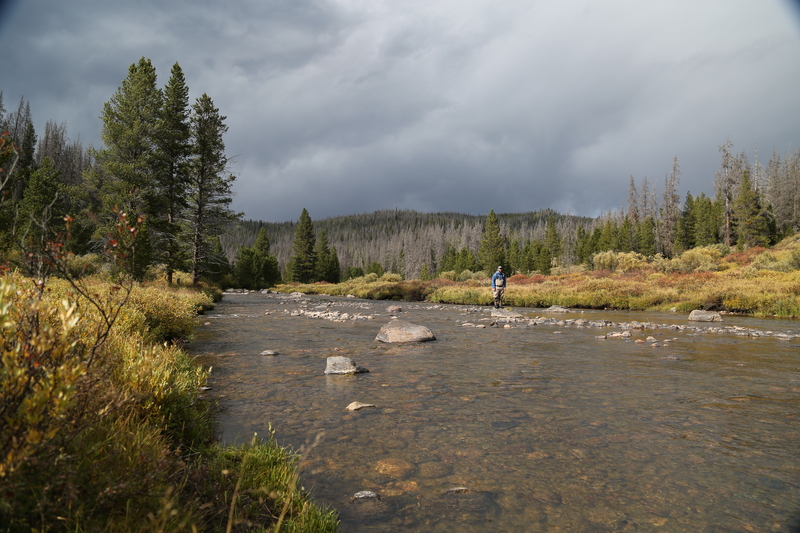 Storm clouds build in the distance over the Encampment River. I tried to use several devices when taking this photo. This photo primarily uses rule of thirds; the tall trees are offset in the left-hand third of the photo. I also tried to use framing in this photo by using the angler on the right side and the trees on the left to frame the river. 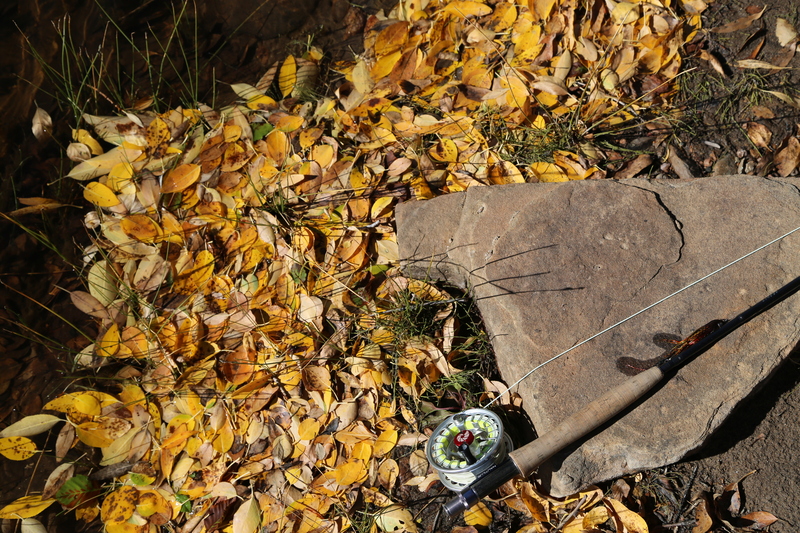 Since the angler on the right side is much less prominent than the trees on the opposite side, balancing elements are created.